Michigan Technological University has been named as having the #6 up and coming undergraduate psychology program in the Midwest in a recent ranking by Best Psychology Degrees. The ranking considered the presence of graduate degree programs, innovative and cutting-edge methods and resources, recent facility updates, research opportunities, internships, student organizations and societies, and “wow” factor. 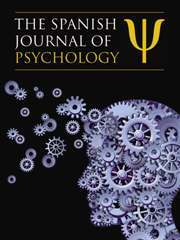 The editors noted psychology students at Michigan Technical University can specialize in areas such as Forensic Psychology, Cognitive Psychology, Human Factors Psychology, and Educational Psychology, highlighting the flexibility of the program. 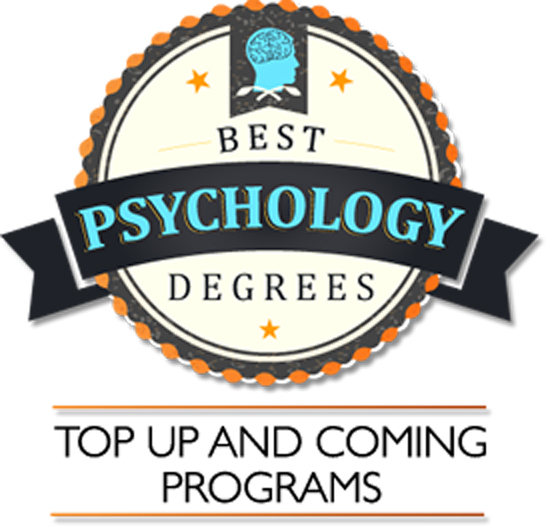 Best Psychology Degrees’ mission is to provide assistance to aspiring psychology professionals in selecting the best degree program for each individual. All psychology majors can participate in internships at local organizations and research opportunities are available in topics including Physical Ergonomics and Individual Differences in Human Performance. Read more at The Keweenaw Report. Is your house drafty? Does your roof grow prize-winning icicles? 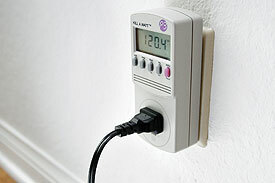 Are energy bills eating up your budget? Have energy vampires invaded your home? The Portage Lake District Library invites kids and their families to learn how to become a Sherlock “Homes” energy detective and search for clues to energy waste from 6 to 7 p.m. Tuesday, November 3, 2015. Participants will learn ways to cut energy losses in their homes and save money. Families will participate in several fun, hands-on activities. “Inspector Gadget” will show how to use a Kill-o-Watt meter to measure energy use of household items and a “Draft-o-Meter” will show how to measure air leaks. With “Keep It Hot, Keep It Cold,” participants will compare the insulating properties of different materials. “Watt’s the Best Light Bulb?” will teach how to measure the light and temperature of different light bulbs and in “Where Are the Leaks?,” temperature with and without insulation will be compared. A free drawing for items from the Homeowner’s Energy Saving Treasure Chest will begin at 7:30 p.m. 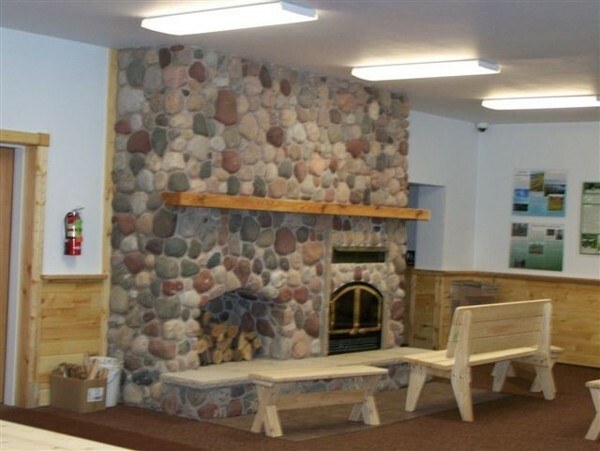 This Energy Education Program is coordinated by the Western U.P. Center for Science, Mathematics and Environmental Education with support from the Houghton Energy Efficiency Team (HEET) and Michigan Tech. From Tech Today, by Portage Lake District Library. Last Friday, October 16, 2015, three Michigan Tech faculty attended TeachingWorks, sponsored by the University of Michigan. Shari Stockero (CLS), Amy Lark (CLS) and Evelyn Johnson (HU) represented Michigan Tech’s Teacher Preparation program. These convenings will continue for three years and are aimed at developing 19 high leverage teaching techniques practiced across the curriculum. TeachingWorks aims to raise the quality of beginning teaching through partnering with teacher preparation programs. Terry Sharik (SFRES) presented the keynote address titled, “Undergraduate Enrollment in U.S. Natural Resource Academic Programs: Trends, Drivers and Implications for the Future of the Profession,” at the Michigan Alliance for Environmental and Outdoor Education annual conference Friday and Saturday in Sault Ste. Marie. Joan Chadde (Center for Science and Environmental Outreach) and a Houghton High School science teacher presented, “Designing a Sustainable Future.” Jean Dunstan, Deidre Erbisch and Michael Hainault, Stanton Township School teachers, presented, “All About Birds: How to Start A Bird Program for Kids.” Marcy Erickson (CSEO) and Nathan Miller, Keweenaw Land Trust, received registration stipends to attend their first MAEOE conference. Science, Math, & Environmental Education, and Michigan Technical University. The session will facilitate teachers’ ability to engage Gr. 4-12 students in learning about sustainability and how to integrate this topic into their science, math, technology, or engineering curriculum. Participants will explore building and site design, renewable energy sources, vehicle design (mechanical engineering), efficient transportation systems (civil engineering), product life cycles and sustainable forestry initiative, food systems, and more. Attendees will receive lessons and resources. Joan is the director of the Center for Science & Environmental Outreach at Michigan Tech University and has more than 30 years of experience in K-12 science and environmental education. 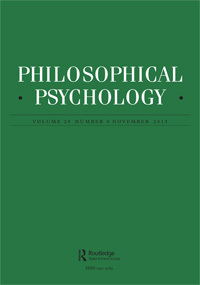 Adam Feltz (CLS) has authored the paper “Financial Surrogate Decision Making: Lessons from Applied Experimental Philosophy” to appear in the Spanish Journal of Psychology. Community Outdoor Nature Programs for Families are free and open to the public. Below are the upcoming sessions. 7:30 -11:00 a.m. Saturday—Trapping and observations of birds and small mammals, with Jesse Knowlton and Dan Haskell (SFRES). Find out what lives at the Marsin Nature Area. The Keweenaw Land Trust is looking for citizen scientists (no experience necessary) to help document observations of birds, small mammals, and other wildlife on the property. Guided hikes will leave the Retreat at 8 a.m., rain or shine. 6-7:30 p.m., Monday—Making Apple Cider (bring your own apples and jugs to take home) with Chris Hohnholt (SFRES), at Nara Nature Center. What to Bring: Dress for the weather and wear good walking shoes. This program is funded by the Michigan Association of Environmental Professionals and coordinated by the Western U.P. Center for Science, Math and Environmental Education and the Michigan Tech Center for Science and Environmental Outreach. For more information, call 7-3341. The Academy of Educators induction ceremony was held on Saturday, October 3, 2015. 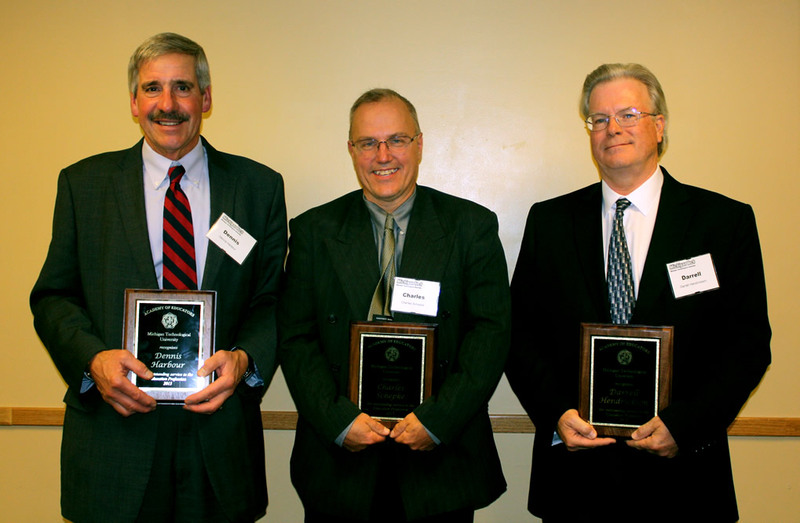 This year two alumni educators and one honorary member were recognized as those who brought distinction to themselves, Michigan Technological University and the Teacher Education program, through their participation, commitment, outstanding leadership, and/or public service in the field of education. Awards were presented by Bruce Seely, Dean, College of Sciences and Arts, Susan Amato-Henderson, Chair, Department of Cognitive and Learning Sciences, and Shari Stockero, Director of Teacher Education, Department of Cognitive and Learning Sciences. Portraits and brief vitae of these distinguished academy members will be prominently displayed in the Department of Cognitive and Learning Sciences to serve as inspirational role models for Michigan Tech students. Amber Kemppainen, a senior lecturer in engineering fundamentals, has been chosen as one of 70 young engineering educators across the nation to participate in the National Academy of Engineering’s Frontiers of Engineering Education Symposium in Irvine, Cal., Oct. 25-28. From Tech Today, by Jenn Donovan. Kempainnen is also a PhD student in Applied Cognitive Science and Human Factors, Cognitive and Learning Sciences. Her advisor is Susan Amato-Henderson. 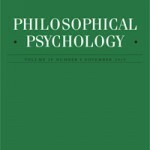 Adam Feltz (CLS) and Brittany Nelson, an undergraduate student in psychology, co-authored the paper, “Experimental Philosophy Needs to Matter: Reply to Andow and Cova,” to appear in the journal Philosophical Psychology.